Welcome to The Dance Factory! We take our roles as a mentors and teachers in your child's life very seriously. It is our objective to inspire a passion for the art of dance in every child who passes through our doors. In the process, we strive to set the right example and help your child (and you) create memories that will last a lifetime. The Dance Factory is committed to providing high-quality dance classes to enhance the overall development of the child. We provide a safe and child-centered environment to encourage our students to explore dance with qualified, nurturing teachers. We believe that dance training encourages young people to develop a positive self-image as they increase awareness of their physical being. Along with improving coordination skills and developing muscular awareness, dance classes give children the freedom to express themselves through movement. The highest educational standards are expected from all The Dance Factory faculty members. They are lifelong learners who continue to educate themselves through certification programs, teacher-training schools, conferences, and other learning opportunities. We hope you enjoy us on this journey! 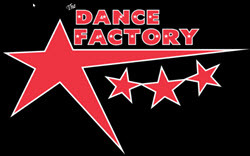 Already Registered with The Dance Factory? New to The Dance Factory? If you have taken classes before with The Dance Factory and you have given us your e-mail address, try the forgot your password link. If not, please contact the office to give us your e-mail address and to set your password.